The first Lao based international fashion brand, Ministry of Silk, recently appointed Audrey Blanchard as the Head Designer for the special collection for Lao Fashion Week 2018. 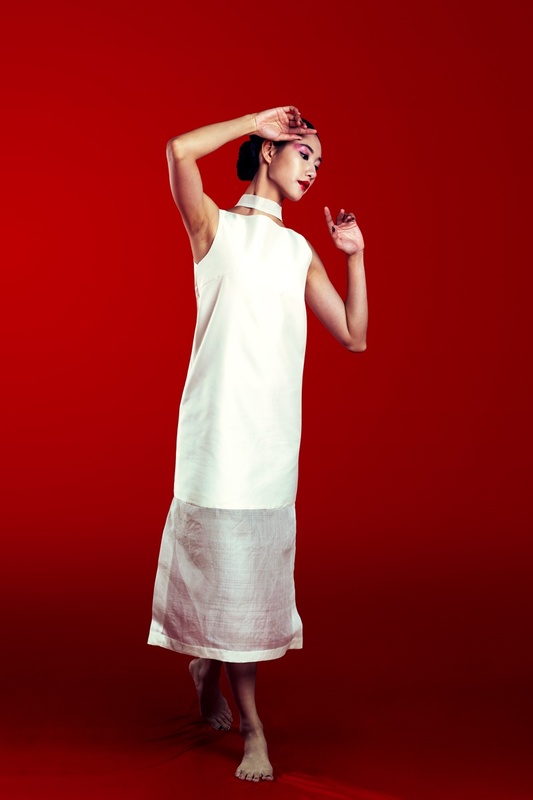 Audrey is a Eurasian Franco-Lao freshly graduated in Fashion design From Bangkok and Hong Kong. Her sense of creativity and art was in her hands since little, where she preferred to draw dresses and motifs. She kept pursuing her dream for discovering and working with Fashion and Creativity by entering University. Her journey started from studies to experiences and finding her passion went From Laos to France a path filled with art and creativity, where she learned about concepts and material manipulation. Her path of entering the Fashion Industry started since Bangkok where she started her minimalistic silhouettes and style with the training of draping on mannequins which is her strong point to have a perfect fit for a garment. Her true passion for textiles which is her strength, started since her first experiences back in Laos with Carol Cassidy, her first mentor which trained her the architecture of weaving and her discover different weaving skills touching fine materials during a cultural trip to Taiwan. A trip where weaving techniques and culture were shared. Her in internship with Carol brought her achievement in savoir-faire and artisanal skills. Seeing and entering the creative industry was an experience which she developed and expressed her fashion in Hong Kong where pressure and hard work refined her art and fashion with beautiful materials. Her training was all about conceptual designing which is the new fashion and also used by most emerging designers. She has also participated in competitions which also defined her style and strength in which category of fashion. A long road of discovering different cultures which is revealed in her fashion and which has lead her now to be the designer for Ministry of Silk by Pany Saignavong which she considers her second mentor. A mentor that has thought her another side of elegance that she never thought had in fashion. Pany’s Philosophy is an inspiration for Audrey. Working with Pany, she was able to do something that she never thought would be able to do and express another creative side of herself and of course expressing the brand’s DNA.